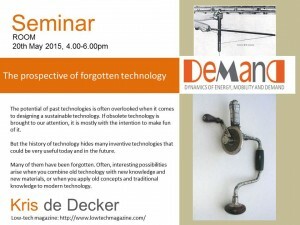 The potential of past technologies is often overlooked when it comes to designing a sustainable technology. If obsolete technology is brought to our attention, it is mostly with the intention to make fun of it. But the history of technology hides many inventive technologies that could be very useful today and in the future. Many of them have been forgotten. Often, interesting possibilities arise when you combine old technology with new knowledge and new materials, or when you apply old concepts and traditional knowledge to modern technology.